An introduction to the history and function of altarpieces. Mari Griffith (in the Gallery): Here, in the National Gallery’s Sainsbury Wing, we’re surrounded by religious paintings from the Renaissance and in these modern galleries with their skylights and sophisticated lighting they can be admired close-up and in detail. Mari Griffith (narrating): Seeing these works in a gallery setting it is easy to forget that they were made first and foremost as sacred objects for churches and were once part of a larger programme of liturgical decoration and furniture. In fact many are fragments, pieces of altarpieces that once stood on or behind an altar, providing a visual focus for people’s prayers and devotion. Perched on a hill above the city of Florence in Tuscany is the church of San Salvatore. The church once housed one of the National Gallery’s Renaissance altarpieces, Zanobi Strozzi’s ‘Annunciation’. Dating from the 1440s, the painting shows the Virgin Mary receiving news that she is to bear the son of god. Behind Archangel Gabriel is a cluster of buildings set on a hill, probably meant to reflect San Salvatore itself. The subjects of altarpieces were also closely connected to the sites for which they were made. Jennifer Sliwka: Inside this church the atmosphere is much as it would have been in the 15th century when the church was built. You can see for example the way the altarpieces hang above the altars in the side chapels, and the way the light filters in through both the chapel lights and above through the clerestory level. The light is much more dim than we might see it in the Gallery for example. Here, the space is in a natural lighting and that is picked up by the flickering of the votive candles in front of the altars. Mari Griffith (narrating): The word altar probably derives from the Latin ‘adolere’, meaning ‘to burn’. The Christian altar originated as a symbol of the table of the Last Supper, and came to be used for the celebration of the Eucharist, commemorating Christ’s sacrifice. From the early 13th century, candles were stipulated as an essential feature of an altar, along with a cross. As well as shedding light for reading the missal, candles were also a sign of the light of faith, thereby figuratively and literally illuminating the words of the Bible. But an altar did not have to have an altarpiece. Mari Griffith (in the Gallery): This painting by the Master of Saint Giles depicts the celebration of mass, the central rite performed at the altar, and it shows how altarpieces were just one element of the ecclesiastical furnishings. Mari Griffith (narrating): They were accompanied by sculptures, crucifixes and reliquaries, and sometimes curtains would veil the altarpieces or the sanctuary. The curtains served both a practical ands symbolic function, protecting the altarpiece from dust, and also concealing and revealing it at certain moments of the liturgy. Although they were sometimes fashioned from metal, or sculpted from wood or stone, altarpieces in Italy were usually painted on panel, as in this work by Sassetta. It shows the funeral of Saint Francis of Assisi, and recalls the way areas in front of or beneath altars often served as burial places for venerated figures. For the congregation in the church, altarpieces offered a tangible visual focus. They often depict the body or the suffering of Christ, in doing so evoking the mystery of transubstantiation – the belief that the Eucharistic bread and wine is transformed into the blood and flesh of Christ at the moment of consecration by the priest. 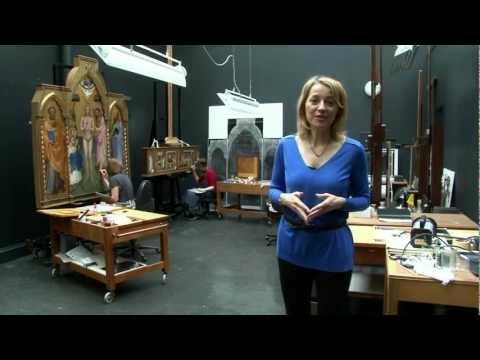 Mari Griffith (in the conservation studios): From the early 14th century, Italian altarpieces were usually made up of a number of panels, a format known as a ‘polyptych’. This example was made in 1387 by the Florentine artist Niccolò di Pietro Gerini. It is currently here, in the National Gallery’s conservation studio, being conserved. Mari Griffith (narrating): As in all polyptychs, panels of different shapes and sizes are united in an architectural, Gothic-style frame. This one is a Victorian replica. But in the early 15th century, the polyptych format began to change with the emergence of the newer Renaissance style. We find evidence of this in Strozzi’s 'Annunciation', made for San Salvatore in Florence. It’s a new style of altarpiece, known in Italian as a ‘pala’. While the earlier, gilded polyptychs conjured up a separate, heavenly realm, the pala altarpieces of the 15th century rooted these religious scenes in a credible world. We also see how painters began making spatially unified images instead of separating the figures into different panels. They also gave their works a greater sense of naturalism through the treatment of light, the scale of the figures, the expressions and the use of perspective. Mari Griffith (in the Gallery): Whatever the style of the altarpiece, producing one was always a very close collaboration between a number of different parties, as we see in this altarpiece by Crivelli. Mari Griffith (narrating): Two patrons were involved and, as is often the case, the painting holds the key to their identity. Directly beneath the Virgin and Child is the coat of arms of the Ottoni family, from Matelica, in the Marche region. Ranuzio Ottoni was a commander of the people’s militia, a ‘gonfaloniere’, hence the presence of the patron saint of soldiers on the right – Sebastian, shown unusually as a chivalric knight rather than the usual tortured martyr, as we see him in the predella below. Opposite him is Saint Jerome, one of the four Fathers of the Church, holding a miniature church building. He represents the second stakeholder, the guardian of the local Franciscan convent, Fra Giorgio di Giacomo. Mari Griffith (in the conservation studios): If commissioning an altarpiece was a collaborative process, then producing one was even more of a team effort, involving numerous artists and craftsmen. Mari Griffith (narrating): The process began with the carpenters who carved the wooden structure, which often cost more than the artists’ work. Once the carcass was ready, the artists prepared the wood with a chalk-like substance called gesso, before the surfaces were gilded and finally painted. At times, due to the scale of the object, the process took place entirely in the church. Mari Griffith (in the Gallery): But the question remains of how many of these altarpieces came to be broken up and their panels scattered around the world. Francesco Pesellino’s altarpiece for the church of Santa Trinità at Pistoia is a case of a jigsaw puzzle that’s been successfully reassembled. Mari Griffith (narrating): Painted in the mid-15th century, by the early 19th century the altarpiece had been sawn into five, possibly six, pieces, and the predella divided into individual scenes. These were sold to private collectors. By today, all but one have been reunited. Quite a feat! Jennifer Sliwka: People often ask why altarpieces were removed from altars, and this sometimes happened early on in their history because fashions changed. So for example one might remove an old-fashioned polyptych and replace it with a Renaissance pala. From the second half of the 18th century into the 19th century many religious institutions were suppressed – for example convents and monasteries – and in this case the altarpieces were removed from altars, and often dismembered or even butchered, and they entered the art market and they were dispersed around the world, and they would enter collections such as the National Gallery. Mari Griffith (in the conservation studios): Which brings us back to the jigsaw. Here in the National Gallery’s conservation studios, we find one tool that helps curators and conservators in their task: X-rays. Mari Griffith (narrating): X-rays can reveal the most unexpected things. When this painting of the Last Supper by Ercole de' Roberti was X-rayed, curators made a surprising discovery. Concealed behind the surface they detected a keyhole, which suggests that the painting was once a cupboard door – the door to the tabernacle within a predella, where the holy bread and wine were stored. Mari Griffith (in the Gallery): All of these things contribute to solving the mystery of these prized works of art, and once-sacred devotional objects. Jennifer Sliwka: In the cases where we can solve these Renaissance jigsaw puzzles it is immensely satisfying and it really gives us a sense of the larger picture, both literally and figuratively. We get a sense of the artistic context but also the spiritual context that these were originally created for. Mari Griffith (in the Gallery): These outstanding works of art, fragments of Renaissance altarpieces, are an enduring testament to religious devotion in the 14th and 15th centuries, showing how art and craftsmanship were once at the service of the higher ideals of religion and devotion. Jennifer Sliwka: Inside this church the atmosphere is much as it would have been in the 15th century when the church was built. You can see for example the way the altarpieces hang above the altars in the side chapels, and the way the light filters in through both the chapel lights and above through the cloister level. The light is much more dim than we might see it in the Gallery for example. Here, the space is in a natural lighting and that is picked up by the flickering of the votive candles in front of the altars. Mari Griffith (narrating): The word altar probably derives from the Latin ‘adolere’, meaning ‘to burn’. The Christian altar originated as a symbol of the table of the Last Supper, and came to be used for the celebration of the Eucharist, commemorating Christ’s sacrifice. From the early-13th century, candles were stipulated as an essential feature of an altar, along with a cross. As well as shedding light for reading the missal, candles were also a sign of the light of faith, thereby figuratively and literally illuminating the words of the Bible. But an altar did not have to have an altarpiece. Although they were sometimes fashioned from metal, or sculpted from wood or stone, altarpieces in Italy were usually painted on panel, as in this work by Sassetta. It shows the funeral of Saint Francis of Assisi, and records the way areas in front of or beneath altars often served as burial places for venerated figures. Mari Griffith (in the conservation studio): From the early 14th century, Italian altarpieces were usually made up of a number of panels, a format known as a ‘polyptych’. This example was made in 1387 by the Florentine artist Niccolò di Pietro Gerini. It is currently here, in the National Gallery’s conservation studio, being conserved. Mari Griffith (narrating): As in all polyptychs, panels of different shapes and sizes are united in an architectural, gothic-style frame. This one is a Victorian replica. But in the early 15th We find evidence of this in Strozzi’s annunciation, made for San Salvatore in Florence. It’s a new style of altarpiece, known in Italian as a ‘pala’. century, the polyptych format began to change with the emergence of the newer Renaissance style. While the earlier, gilded polyptychs conjured up a separate, heavenly realm, the pala altarpieces of the 15th century rooted these religious scenes in a credible world. We also see how painters began making spacially unified images instead of separating the figures into different panels. They also gave their works a greater sense of naturalism through the treatment of light, the scale of the figures, the expressions and the use of perspective. Mari Griffith (in the conservation studio): If commissioning an altarpiece was a collaborative process, then producing one was even more of a team effort, involving numerous artists and craftsmen. Mari Griffith (narrating): The process began with the carpenters who carved the wooden structure, which often cost more than the artists’ work. Once the carcass was ready, the artists prepared the wood with a chalk-like substance called gesso, before the surfaces were gilded and finally painted. At times, due to the scale of the object, the process took place entirely within the church. Mari Griffith (in the Gallery): But the question remains of how many of these altarpieces came to be broken up and their panels scattered around the world. Francesco Pesellino’s altarpiece for the church of Santa Trinità Pistoia is a case of a jigsaw puzzle that’s been successfully reassembled. Mari Griffith (narrating): Painted in the mid-15thth century, by the early 19 century the altarpiece had been sawn into five, possibly six, pieces, and the predella divided into individual scenes. These were sold to private collectors. By today, all but one have been reunited. Quite a feat! Jennifer Sliwka: People often ask why altarpieces were removed from altars, and this sometimes happened early on in their history because fashions changed. So for example one might remove an old-fashioned polyptych and replace it with a Renaissance pala. From the second half of the 18thth century into the 19 century many religious institutions were suppressed – for example convents and monasteries – and in this case the altarpieces were removed from altars, and often dismembered or even butchered, and they entered the art market and they were dispersed around the world, and they would enter collections such as the National Gallery. Mari Griffith (in the Gallery): These outstanding works of art, fragments of Renaissance altarpieces, are an enduring testament to religious devotion in the 14thth and 15 centuries, showing how art and craftsmanship were once at the service of the higher ideals of religion and devotion. Curator Colin Wiggins introduces the Saints Alive: Student Study Day at the National Gallery, held on the 1 November 2013. Colin is followed by Dr Jennifer Sliwka speaking about 'Saints: The Forgotten Stories'. Jennifer is the Howard and Roberta Ahmanson Fellow in Art and Religion at the National Gallery. Dillian Gordon: This was a very exciting occasion for the National Gallery. A photograph of ‘The Virgin and Child’ had been sent to Joanna Cannon at the Courtauld Institute and she recognised that it belonged with ‘The Man of Sorrows’, which at some stage of its life has been thought to be Venetian. She’s a friend of mine and when I heard about this I thought it would be an exciting opportunity for the Gallery to acquire these panels because we have very few paintings of the 13th century. It was always going to be a complicated process because the two panels were obviously in different collections and they hadn’t been together for probably over 100 years. So we were hoping that the owners of each panel would agree to sell to the National Gallery and we could bring the two panels together. And there was a very exciting period over Christmas 1998 to January 1999 when we were negotiating and finally we were successful and the two panels came together. And of course there’s absolutely no question that they belong together. The backs are painted with imitation porphyry with hooks which definitely fit together and on the front you can see that the punching on both is identical. And the virgin is gesturing towards her child and looking sorrowfully out at the spectator, knowing that the child will be crucified and that he will end up as ‘The Man of Sorrows’ on the Cross. Miranda Hinkley: So you’ve sort of got life and death on one side and the other. Dillian Gordon: Yes, very much so. The child, infant Christ as a baby in his mother’s arms, and then the adult Christ with his arms folded in suffering outlined against the Cross, and the angels above are covering their faces in mourning. Miranda Hinkley: Dillian, you mentioned that originally it had been thought that figure of Christ was thought to be of Venetian origin; has the process of reuniting these panels shed new light on their origin? Dillian Gordon: Yes, that’s another very exciting aspect. ‘The Virgin and Child’ is unquestionably Umbrian and by putting the two together and realising that in fact ‘The Man of Sorrows’ is Umbrian as well, there are several comparative examples of Umbrian painting, particularly of course with crucifixes, where we can show it’s an Umbrian painter. It’s, of course, an anonymous painter and we don’t know who it was painted for. It’s an object for private devotion. It would have been something that you could perhaps slip into a leather case and travel around with and then open and use for your private prayer. One of the most unusual aspects of this painting is the very elaborate punching that you have all up the borders and around the Virgin’s halo. It’s extremely delicate and, as I say, unusual, for a 13th-century painting at this stage. It becomes much more common in later paintings. Miranda Hinkley: Very, very delicate isn’t it? You’ve got floral motifs and intertwining plant forms and stems curling round, but each one is very, very delicately done. How would that have been rendered? Dillian Gordon: The artist would have had an iron tool which he would strike into the gold leaf and depending on the pressure the result would be very slightly different, so sometimes the punches look slightly different but they’ve been made with the same tool. Miranda Hinkley: Well, when this piece arrived here at the National Gallery, it was in quite a different state to the condition it’s in now. Martin Wyld, you’ve been working on it here in Conservation. Tell us about the condition it was in when it arrived. Martin Wyld: Well, we could see that it was in very good condition, but it was quite obscured by probably several hundred years worth of varnish and wax polish and dirt settling on it, and at some point when the panels were still together, we think that someone had tried to clean up the figures of Christ and the Virgin and Child and they seem to have pushed all the dirt into the punch marks and incised lines, so instead of having a sort of sparkly punch-marked and incised background, they were like a series of sort of black full stops all over it, and that was the main difference. Miranda Hinkley: And how have you worked to clean that off? Martin Wyld: Well, I had to do most of the work under a microscope because as you can see some of the punch marks are about a millimetre across. I’ve been able to use some sort of white spirit and solvent mixed together to soften the black deposits in the punch marks, and then scrape them out with a sharpened stick, working under a microscope at about 15 times magnification. It has taken quite a long time, but I think it’s been well worth it. Miranda Hinkley: Originally these would have been hinged together so that you could actually close the whole thing up like a book. When you’ve finished the cleaning process how is it going to be presented to people? Martin Wyld: As they were before, which is they’ll be clamped to a padded backboard right next to each other, which is how they would have originally been seen. Miranda Hinkley: Well, it’s very exciting to have such exquisite workmanship reunited so visitors can see it as it would have originally been. Dillian Gordon: You’re quite right. There’s nothing like it in the collection and, indeed, really there’s nothing like it surviving in the world. There are comparatively few 13th-century paintings still surviving in private hands, so we were extremely lucky to be able to buy this. These are objects which in their own right as independent panels are very beautiful and of course reuniting them has made them an object which is absolutely unique. Miranda Hinkley (in the studio): Thanks to Dillian Gordon and Martin Wyld. Colin Wiggins talks about the 'History of the Collection' at the Saints Alive: Student Study Day at the National Gallery, held on the 1 November 2013. Colin is Special Projects Curator at the National Gallery. Gill Perry talks about 'Playing - with Michael Landy' at the Saints Alive: Student Study Day at the National Gallery, held on the 1 November 2013. Gill is Professor of Art History at The Open University. Curator Colin Wiggins in discussion with artist Michael Landy at the Saints Alive: Student Study Day at the National Gallery, held on the 1 November 2013. Michael Landy was the Associate Artist at the National Gallery and Colin Wiggins is the Special Projects Curator. Michael Landy, Gill Perry and Colin Wiggins have a final discussion at the Saints Alive: Student Study Day at the National Gallery, held on the 1 November 2013.